According to Seeking Alpha, investment banking firm Credit Suisse has weighed in with its own note to investors that include the bank's estimates for Apple this year. Based on its own analysis, Credit Suisse sees iPhone sales declining 12.4% from last year's figure. That is a steeper decline than 2018's 3.2% decline. Last year, Apple sold nearly 218 million handsets globally, which means Credit Suisse expects 191 million units to be rung up this year. One of the reasons for the decline in iPhone sales, according to the bank, is that owners are holding on to their current iPhones for a longer period of time before upgrading to a new model. In addition, the analysts say that Apple won't be hiking iPhone prices thus eliminating higher pricing as a source of revenue growth. In China, where Apple recently cut the prices of its 2018 iPhones by up to 6%, Credit Suisse's analysts say that "deeper structural challenges" will continue to damper Apple's handset sales in the market, even with the price cuts. The investment banking outfit doesn't see any change in iPhone demand in China until 2020. That's when we could see a refreshed design for the line along with a model that supports 5G wireless connectivity. But even Apple knew not to expect iPhone sales to grow forever. That's why it set a goal to double revenue collected from its services unit from 2016's $25 billion to $50 billion next year. While the iPhone accounts for a leading 60% of Apple's annual gross, the services unit is next and depends on the large number of active iPhones used around the world. It is also Apple's most profitable division and includes AppleCare, Apple Music, the App Store, iTunes, Apple Pay, Apple News+, Apple TV+, Apple Arcade (when it launches this fall) and more. So you can understand why Apple is placing more importance on collecting incremental subscription revenue from iPhone owners. Credit Suisse sees Apple hiking services revenue from the $40 billion it collected in 2018 to $65 billion by 2021. For the fiscal first quarter of 2019, which covered October through December last year, Apple generated services revenue of close to $11 billion. That was a 19% year-over-year gain. Meanwhile, iPhone revenue declined 15% during the holiday quarter (the last reported by the company) to $51.9 billion. That was a $7.9 billion decline from the $59.8 billion Apple collected from handset sales during the same period in 2017. The report notes that Apple has a record of 1.4 billion active devices globally with more than 900 million of them being iPhone models. As is typical for this time of year, rumors about the upcoming iPhone models have been all over the place. The latest speculation, from Japan's Macotakara, calls for larger screen sizes for the Apple iPhone XI Max (6.5-inch AMOLED display) and the iPhone XI (6.1-inch AMOLED display). Both of these models should be equipped with a triple-camera setup on the back and could be thinner this year. 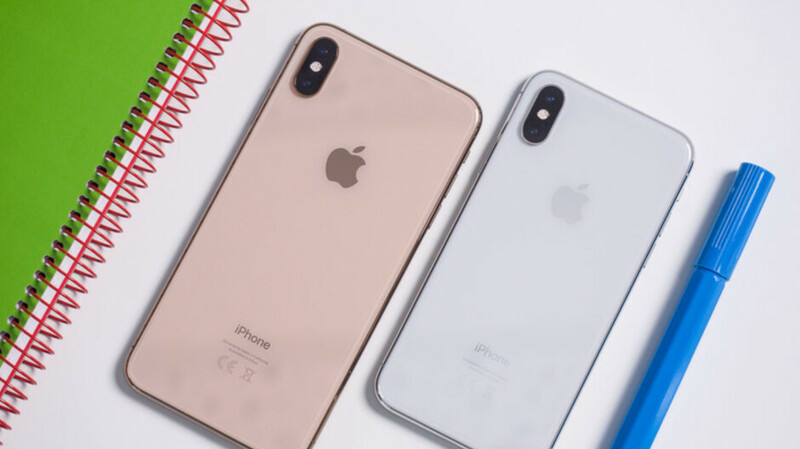 TF International analyst Ming-Chi Kuo, who has an enviable track record when it comes to predicting upcoming Apple hardware, expects to see a bump in battery capacity for the 2019 iPhone models. With the expected .5-inch increase in screen size, Kuo says that the iPhone XI could sport a battery in the range of 3189mAh to 3322mAh. That would be up sharply from the 2658mAh battery currently employed on the iPhone XS. While the iPhone XS Max is currently powered by a 3174mAh battery, Kuo says that the iPhone XI Max could carry a battery with a capacity somewhere between 3491mAh and 3650mAh. The iPhone XR, which has the best battery life of any iPhone ever, might not see a hike in battery capacity for the 2019 version Kuo says. Still, the analyst says that Apple is considering a 3089mAh battery for the 2019 version of the "more affordable" iPhone, up from the 2942mAh battery found inside the current unit. Overall, Credit Suisse has started its coverage of Apple's shares by slapping a neutral rating on the stock. I’m willing to bet all premium smartphone-sales is going down 2019. Smartphones is going the computer-cycle. Upgrades every 3-4 years. Blackberry didn’t have 1 billion active users. No but Nokia had more than 1 billion, and we all know how that went when being stubborn. Yuppers. Holding out for Microsoft when they didn't even have their windows phone OS ready was a huge mistake for them. They should have said no to ms and just went with Android instead. They couldn't, they hired an MS troll as CEO. This is why app devs should have jumped on Android from the very beginning and they should have been making equal quality apps on Android. But many of them are lazy and spent all their time making iOS apps awesome and then get lazy with Android apps. Now their will start losing money and will look for ways to recoup and they all gonna come running to Android and iOS is gonna fade away into extinction. Like Symbian, Windows Mobile/Phone, Palm OS, BBOS and more. All we need is Windows and Android. If the iPhone users that spend money on apps will jump ship that will be the issue. But as long as iPhone-users spend more then android then the developers stay. I don’t think devs are lazy with Android, it just so much harder job to do because of huge fragmentation and it’s just not worth of all that time. Why you think they start losing money? Didn’t you read this article? Appstore is doing more money than ever before. Which means more to devs than never before. IOS not gonna fade anywhere in a very very long time. He isn't wrong, it is a bit more difficult to develop for Android and has been until very recently. Last year they released Android jetpack with persistence libraries and this year with navigation library and only NOW it feels as though the Android device kit has caught up and possibly surpassed iOS. But that's also a problem for Apple because now it's very easy on Android and the OS scales better feature and future wise. So I think devs might finally leave the garden of Apples. Do you know that apple gets more profit in services now. Devs loves apple because people buy apps and subscribe. I have said this a million times before. Apple may just be looking at Blackberry if they don't learn from the demand and supply curve. Putting bigger batteries, more ram, 5G not ready for primetime, more camera lenses are innovation? Android just want to be the first in the industry. Mobile industry is already saturated. Services and maintaining userbase are the main focus of the tech. I can't wait for the 20129 iPhone models..... They will be so futuristic. No they won't. They are gonna look exactly like the previous X models, with a bigger uglier camera bump. Apple has already stated the 2019 models were not gonna be much different from last years. Samsung has set the highend bar years ago with the S6. The S8 the the full culmination of the edge design. It can't change anymore. The S10 is this years bar to beat and honestly, no OEM is gonna top the S10 this year. Not even Apple. The P30 IMO is the only phone I feel that is a good and very close 2nd place with the S10. The Pixel is just junk with vanilla Android. Every reviewer even PA, likes Samsung One UI. It could use some more tweaking. But out the box it is surely far better than TouchWiz. the Samsung Experience was clean and good too. Even though I don't like the new One UI, it is clean and works fast. Finally someone notices the typo in the article besides me. Dude above just doesn't get it. I got it in first instance.. In the year 20129...we'll probably be born with our phones already implanted in our brains lol. Nah. basically all apple fans just need to face the facts that the rest of us have been telling them was gonna happen. Just like with PC's, we have gotten to a point where you don't need to upgrade as often. But the problem with upgrading isn't that people don't want to buy a new phone every year. The problem is the price at $1000 for the phone they actually may want, prevents them from upgrading every year. ”The problem is the price at $1000 for the phone they actually may want, prevents them from upgrading every year.” If you upgrade iPhone every year, it would cost for you around $300-400. You know iPhone has great resell value unlike Android phones. No it’s not that we want them, we already have great earlier models and don’t see it worth of upgrade, that maybe happens this year or next year if nothing big have happened it will iPhone again when it’s time to upgrade. Absolutely. It used to cost me $200 to upgrade to the latest and greatest every year thanks to the amazing reslae value of previous iPhones. But since few years, I was not impressed with their offerings and my old phone was working amazing. People get a wrong opinion that $1000 is the issue Apple is facing. But I think people would spend on iPhones if and only if they are worth upgrading. Both Apple and Samsung are bleeding because of their premium models costing $1000. The problem with Apple though is, they set a bar where they can't come down. Their only reprieve is, they need to release more models at lower price points. While Alan wrote an article saying if any of those Chinese OEM's start to sell phone sin the US, Apple and Samsung will be in trouble; he was 100% right. They will be. But Apple would be in far more trouble than Samsung. Because Samsung has multiple models and can compete with the Chinese at every single price point, while Apple cannot. Can't put all your eggs in one basket. Diversity is key. Microsoft, Google, Samsung and others understood this for years. ”While Alan wrote an article saying if any of those Chinese OEM's start to sell phone sin the US, Apple and Samsung will be in trouble; he was 100% right.” Apple wouldn’t be in trouble, give me one reason why US people would switch to no-name Android brand? If they want Android phone they would already have chosen one from the market, there’s nothing what those Chinese companies could offer for Apple users what current Android phones already doesn’t have. People buy iPhone because iOS. You know especially in US people hate to see green bubble. Didn’t you read the article where by far most oneplus 6t and pixel 3 buyers came from Samsung? Very few from Apple. This exactly shows that Apple have nothing to worry because they have iOS. Samsung is in very big trouble and it’s showing in EU already and China and many other places. Huawei, oneplus and xiaomi are stealing Samsung sales all the time. Are you talking market share? Because, no, it's not.